Henry Richard was the secretary of the Peace Society from 1848 to 1886, an unconditional pacifist when the British Empire was at the height of its aggressive powers. He opposed British military adventures in the Crimea, Egypt, Afghanistan, South Africa, China and Burma and advocated a system of arbitration to settle disputes between countries. As MP for Merthyr and Aberdare from 1868 to 1888 he continued this battle in Parliament with some notable successes. His radical politics were honed within the circle of Free Traders, Anti-Corn Law Leaguers and the Peace Society. In Parliament he defended Wales and its language and was active in the development Welsh education. He opposed sectarian schools and the teaching of religion in schools, especially when funded from the public purse. He was a politician of considerable skill – and totally uncompromising. Gwyn Griffiths was born in Tregaron, the same village as the subject of this work. In the course of a career encompassing the youth service, journalism, translation, broadcasting and PR, he has written travel books, a history of the Breton onion men and the Welsh National Anthem and co-edited The Turn of the Ermine – an anthology of Breton Literature. This readable and fascinating book gives an insight into the life of a Henry Richard, who remained faithful all his life to his understanding of Christian nonviolence. Richard was born in Tregaron in 1812 and trained as a Nonconformist minister in London. Although his ‘lot was cast in London’, he remained rooted in Welsh nonconformist tradition and culture. Although a successful minister, he gave up his post to become full time Secretary of the Peace Society, and in 1868 became MP for Merthyr and Aberdare, a seat which he held for over 20 years. 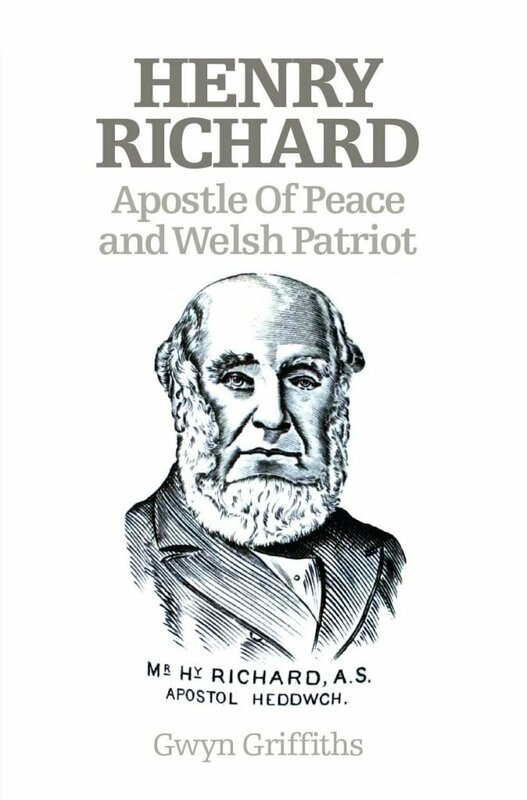 Until his death in 1888, Richard preached, wrote, campaigned, organised conferences and congresses across Europe, traveled and spoke in the cause of peace. The wealth of detail in the book brings to life his tireless work, his successes, and also the conflicts and personality clashes of a determined and probably rather stubborn man. Although his work for peace was uppermost, Richard worked for various other causes. He was a strong supporter of school and higher education in Wales, perhaps surprisingly championing secular education. He believed that parents and Sunday Schools should undertake religious education, and admired Dutch secular co-educational schools, noting that physical punishment was not used. He also worked for disestablishment of the Church of England, believing that it had a stranglehold on education and social activity. This was partly driven by his love of Wales, its language, culture and nonconformist religion, and his feeling that the Church of England misunderstood and denigrated all that was good in the Welsh culture. Richard’s life was driven by the desire to live what he understood as real Christianity. He was not afraid to hold unpopular opinions or to denounce the established church. In this he recalls some of the early Quakers, when he claimed in a speech “Yes, we have a right to say to popes, cardinals and prelates, and other representatives of official religion all over the world ‘the name of God is blasphemed among the nations because of you’.” This is one of many quotes throughout the book which I will remember – other readers will certainly find passages which inspire and speak to them. I first encountered Henry Richard when writing about the laity in Congregationalism, for his claim to fame here is as the first lay Chairman of the Congregational Union in 1876. Not all Congregationalists welcomed the distinction of clergy and laity and in Richard’s case it was misleading for he was ordained as a Congregational Minister and served as such for fifteen years before feeling called to devote all his energies to the Peace Society that flourished in the 1830s and 1840s until subdued by what we would call the “Falklands factor”, wild enthusiasm for the Crimean War. Later, and as a proud native of the village of Tregaron, near Aberystwyth, he felt called to be an MP. At the time almost all Welsh MPs were Anglicans and had little sympathy for the Welsh, the vast majority of whom were then Nonconformists. Henry Richard, the “Apostle of Peace”, made his mark as “the Member for Wales”. This well researched biography can also serve as a refresher course in nineteenth century Welsh, English, European and American History. Name any major event and Richard (1812-88) seems to have been involved in it and was in close contact with many of the protagonists. On the Anti-Slavery campaign in Lincoln’s America he knew and supported Harriet Beecher Stowe, author of Uncle Tom s Cabin and on other issues was in close touch with Cobden and Bright. Gladstone praised him for changing his mind about Wales. So read on. And if you wish to see a fine statue of the man himself, visit Tregaron. He is there, just outside the public house, and in those Nonconformist Temperance days probably had no wish to go in.